Sheehan World Archive Edition: Molly Mahoney Is Born; Trisha Is a Granny! Molly Makes Trisha a Granny! 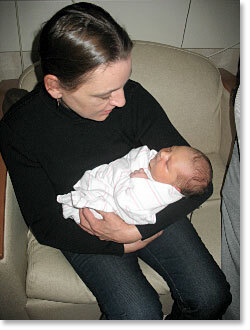 (April 2008) -- Good golly: It's a Molly! And Trisha is a grandmother! Woohoo! In an exclusive interview with The Sheehan World about a half hour after her daughter-in-law Dee Mahoney gave birth to Molly Carroll Mahoney in Concord, Mass., Trisha Mahoney pronounced that she was actually happy to be a grandmother! "I'm happy. Everyone is happy," Trisha said. Granny-Moe immediately dashed off to go on a pink shopping spree. Proud Daddy, Mike "The Godson" Mahoney described his first child (and The Sheehan World's newest great niece) as looking a lot like her father but with Dee's mouth and eye shape. "She has the Mahoney round head," he added. "She's gorgeous. She's great," added an exhausted Dee. 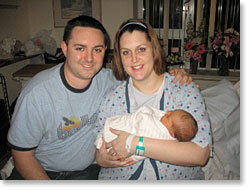 The Virgo mother labored more than 24 hours before Molly was delivered by C-section about 10 p.m. Tuesday, April 1. Molly Mahoney (at right with her parents and with Trisha) weighed in at 8 pounds, 15 ounces and "came out screaming," according to several witnesses. Molly measures 21 inches, has long legs, arms and "piano fingers" and lots of black hair. A crowd of Mahoneys (Uncles Dan and Paul and Grandpa Moe among them) and Carrolls, including Dee's parents Bill and Lorraine Carroll, had been standing by the hospital when Dee went in on Monday, March 31, to offer support. 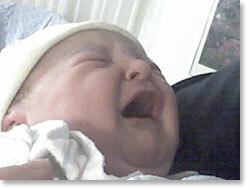 Shortly after Molly's birth, celebrations broke out on two coasts, including in Bellingham. Great Uncle Chuck in Bellingham, Wash., let out a whoop and then immediately wanted to know: "Will she be known as Moe?" To avoid confusion with Granny-Moe, Grandpa Moe and other family members known as Moe, Molly might be nicknamed "Mo-Ella," according to Trisha. Great Uncle Billy Sheehan of Medford, Mass., suggested Molly-Moe or G-3. Most of the 2nd and 3rd generation of the Sheehan World family have been boys. Molly is only the third girl in those two generations, following Colleen (G-1) and Kerry (G-2). Hence, G-3. 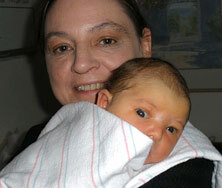 Molly is also the third great-niece of Sheehan World publisher Kathy Sheehan, following Whitney Best and Paige Cook. The Sheehan World is the world's leading online newspaper for all things important in (Great Aunt) Kathy Sheehan's world and has been in continuous circulation since 1995.